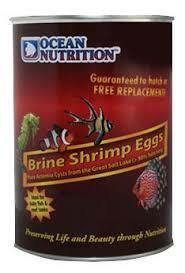 100% Brine Shrimp eggs from the Great Salt Lake. Extremely high hatch rate. Get the full benefits of live food as well as the nutritional value for growth. Brine Shrimp are well accepted by fry and small fish. Innovative Nitro Pack inner package assures a great hatch. Ideal for reef tanks and baby fish! Use 25gr to 35gr (+/- 1 soupspoon) of salt per litre and add +/- 2gr of brine shrimp eggs per litre. Use tap water and pour salt into the cone with air pump running. When using kitchen salt, it is best is to add +/- 3gr (1 teaspoon) of sodium-bicarbonate (backing soda). Make sure the water temperature is maintained between 26� - 29� during the incubation period. (Do not exceed 30�C, as improper temperature control is the main reason for a bad hatch). The air line should reach to the bottom of the hatching vessel to ensure vigorous and homogenous mixing. An air stone is not recommended. Add the eggs to the hatching water and make sure air keeps eggs in suspension. Eggs will hatch into very tiny, nearly microscopic "Nauplii" (babies) in 18 to 30 hours. You can harvest by removing the air tube and waiting two to five minutes for the orange nauplii to come to the bottom of the cone. After 24 hours stop aeration and wait 10 minutes until nauplii settle to the bottom. Empty shells will float at the surface. Siphon the nauplii on a sieve, rinse carefully with tap water and feed to your animals.